One of the things I love the most about the Rochester area is the abundance of locally owned, amazing restaurants. I mean, who wants to cook for one with all of this goodness at my fingertips? I tend to do the healthier thing during the week, by eating a bowl of oatmeal or a Clif bar for breakfast at work. But come the weekend, I want something big and satisfying and a little unique. 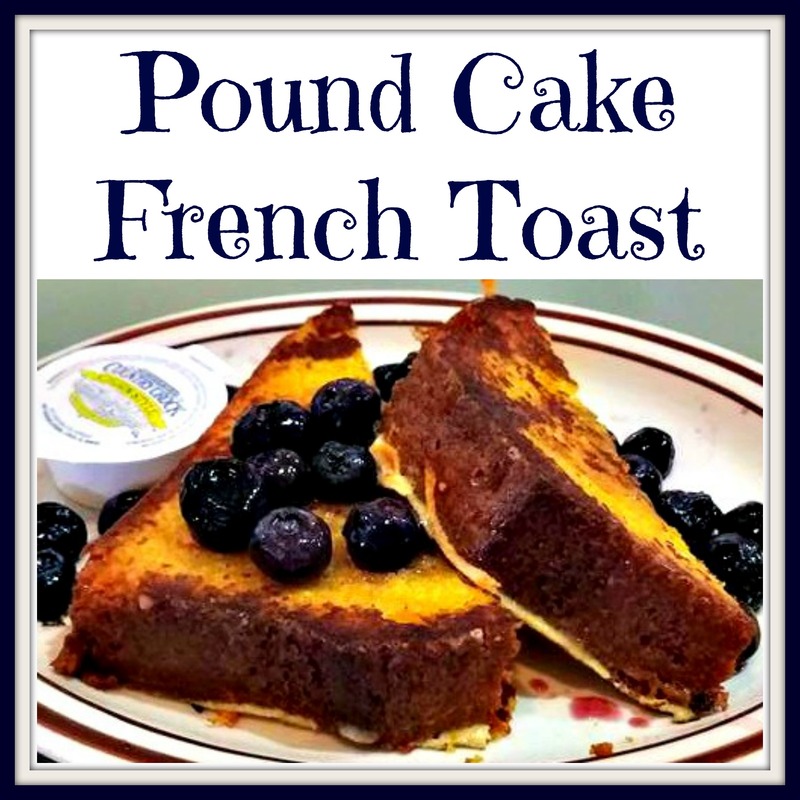 Thank you, Country Club Diner, for teaching me about pound cake French toast! Wait, pound cake French toast? Yes, and it is just as lovely as it sounds. See, French toast used to be one of my favorite breakfasts when I went out. Give it to me plain, with cinnamon swirl bread, or stuffed. But now my body can no longer handle the yeast in the regular bread, so I have to enjoy alternatives when they pop up. This restaurant does a great job coming up with fun alternatives. I have had cinnamon bun French toast, frycake French toast, and a few times over the past year, pound cake French toast. 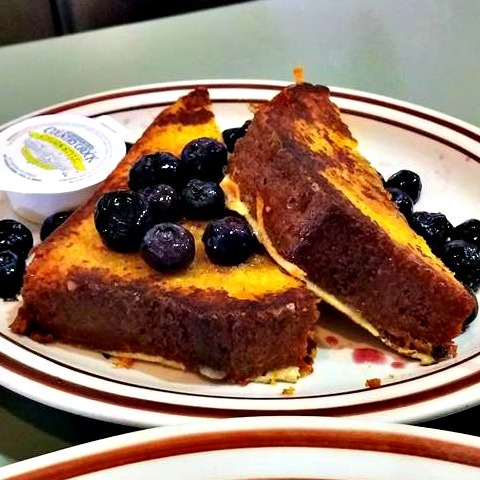 Early in 2017, I treated myself with this luscious lemon pound cake French toast, served with blueberries. I am guessing that they are using a prepackaged lemon pound cake, instead of making their own, just for the sake of ease. I do believe they have made some of their own loaves in the past, though, such as a lemon poppyseed one that I had last year. I remember double-checking ingredients on that one before trying it. I say if you’re good at making your own pound cake and want to control your ingredients, go homemade all the way. Otherwise, you can easily find some good, solid pound cake at your local bakery or grocery store. You don’t want a crumbly one, or it won’t work right. To prepare the pound cake French toast, you do it in the usual way. Cut a nice, thick slab of pound cake, like you would want a nice, thick slice of bread for regular French toast. Dip it in some whisked raw egg to coat it. You won’t need to add anything like sugar or vanilla to the egg, because the pound cake is already lusciously sweet and flavorful. Cook the egg-covered slice in a stovetop pan, browning it on both sides. Serve immediately. I like the garnish of fresh fruit on top of the pound cake, to give it even more flavor. Plus, fruit at breakfast is always a nice touch. They serve it with Country Crock, because this place never serves real butter. (I would prefer real butter, but you don’t need it.) You can also pour some syrup on it, but trust me, you won’t need that, either. A good pound cake is already moist. And as I said, it already is sweet and has good flavor. 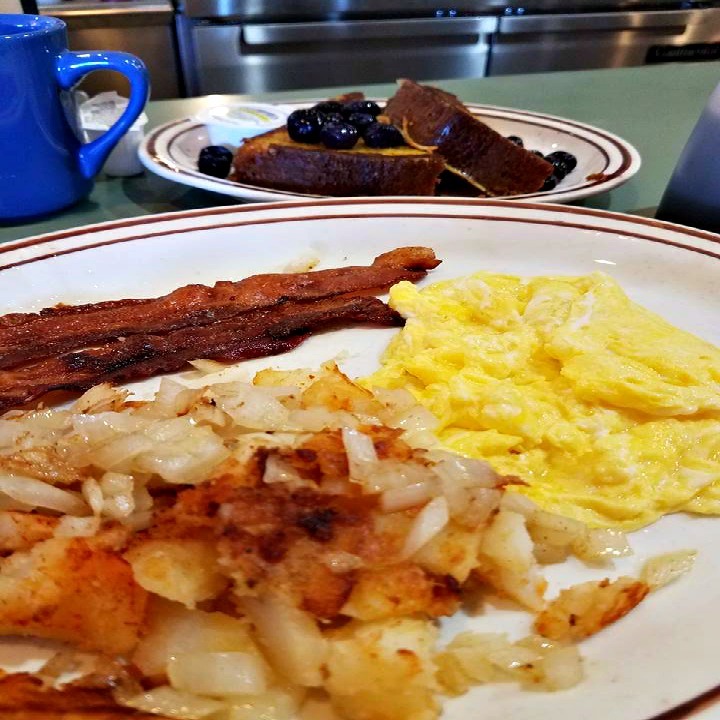 The other part of this breakfast that I like at this diner is that the pound cake French toast comes with your choice of eggs, meat, and potatoes. I have been married to scrambled eggs since about birth. I like their bacon better than their sausage. And one of the servers there taught me a couple of years ago about the joy of home fries with onions, and theirs are always done to perfection that way. All of this food keeps you full for about the entire day. In fact, I almost had to take part of that pound cake French toast home! And even with the cup of flavored coffee, the bill still comes to under $10. You just can’t beat that. So which flavor would you like to try? I say the possibilities are endless. Another one I remember having sometimes over the past year or so was a raspberry pound cake, served with fresh berries on top. So many combinations are available. Let me know how yours turns out and what flavor combination you try to make!